Sad Computer ransomware is a file locker that allows paying the stated price via Bitcoins or PayPal account. This notorious virus uses the Advanced Encryption Standard for disabling access to certain types of files and documents. Moreover, each file is left with the .sad appendix and cannot be used until the decryption tool is used – it is capable of breaking through the robust code. The Sad Computer virus developers offer a solution for the encrypted data, they ask for some money for the decryption tool in the sadcomputer_note.txt text document and provide two ways of paying them – via the Bitcoin wallet or PayPal. Additionally, this ransomware malware brings malicious payload straight into the system and might place it in the \Desktop\User_folders\% TEMP%\ folder. 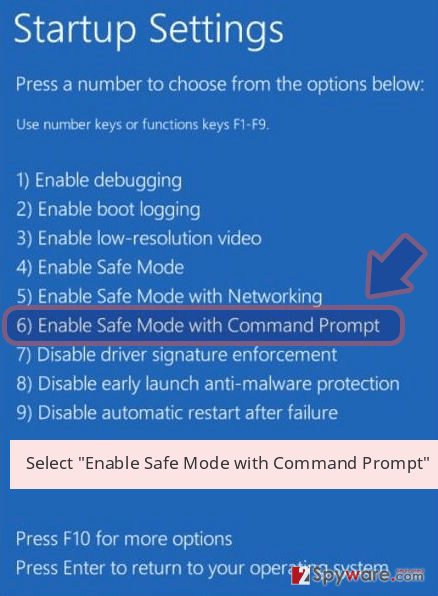 One of the suspicious files placed inside is SadComputer.exe and might be used to launch malware-laden activities on the infected machine. The virus can be distributed via email spam, malicious attachments, RDPs, outdated software, etc. Q: What Happend to my computer? A: Your Files Have Been Encrypted. 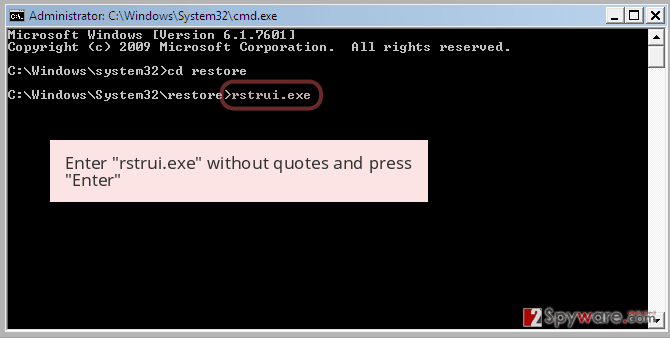 Q: How Do i restore the files? A: You need to use bitcoin to restore the files. Q: Can i use other methods? A: Yes. You can use Paypal. A: We dont cheat users. We restore the files. As you can see the ransom message is written in concise text in dialogue type. This is a bit unusual as usually ransom notes contain much more information distributed in paragraphs. 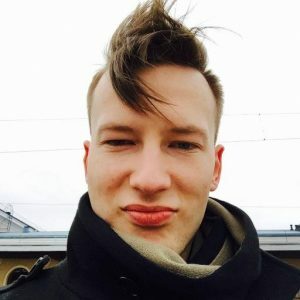 Talking about the ransom price, just like other similar threats, Sad Computer ransomware authors might ask between $500 and $1500, or even more. However, do not rush to contact the criminals and give away your money. Even though you might be frustrated at the moment, you should think over everything calmly. Rather than paying the crooks, you should remove Sad Computer ransomware from the system and use data recovery software that is provided at the end of this page. Sad Computer ransomware might bring other unwanted and malicious changes to your computer system. 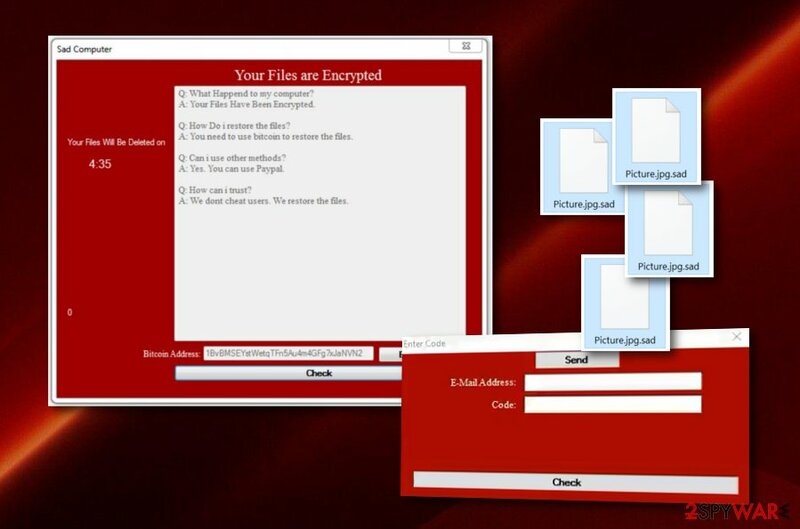 File encryption might be only a part of the activities that this ransomware virus is capable of, as you might notice changes in your Windows Registry and entries that might be malicious and planted for persistence reasons. To perform Sad Computer ransomware removal, scan the entire computer system with tools such as Reimage or Malwarebytes MalwarebytesCombo Cleaner and search for locations in which malware-related content might be placed. All of these directories need to be cleaned to ensure that the computer system is brought to its previous state. 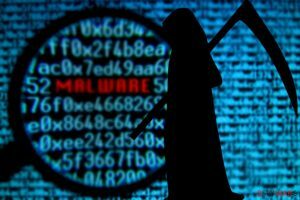 Ransomware infections are lurking all over the cyberspace as more and more of them are being released daily. For example, Djvu ransomware has also released numerous of its versions which are almost identical to one another. The increasing rate of ransomware infections is a sign that users need to be more concerned about their computer protection and safety. In order to increase protection, you need to understand what needs to be avoided while browsing the internet. According to technology experts from Avirus.hu, ransomware threats are distributed by using unsafe RDP configuration, spam emails, and their malicious attachments, insecure downloads, botnets, and in some cases, outdated entries or software. For your computer and your safety, you should always identify which email letters are worth opening and which are not. All clipped attachments need to be scanned with anti-malware if they have a questionable look. Continuously, make sure that all of your programs are always up-to-date, that includes your antivirus software too. Last but not least, avoid visiting third-party networks where the risk of catching a ransomware infection is high. There is only one reliable way to remove Sad Computer virus from your Windows operating system, and it is by using reputable computer software. If you want to recover some of your files, this process is necessary to perform, and the sooner, the better. Scanning the entire system with automatic software is also a beneficial thing as it will help you to find locations in which malware might be placed. For this process, install tools such as Reimage, Malwarebytes MalwarebytesCombo Cleaner, Plumbytes Anti-MalwareMalwarebytes Malwarebytes. The Sad Computer ransomware removal needs to be done with care to make sure that the cyber threat will not launch automatically after computer reboot. When your system is clean, you can try using some data recovery software that we have provided below. Scroll down until you find the most suitable method for you. For future data safety, purchase a portable drive or store copies of valuable files on some type of remote servers. Log in to your infected account and start the browser. Download Reimage or other legitimate anti-spyware program. Update it before a full system scan and remove malicious files that belong to your ransomware and complete Sad Computer removal. 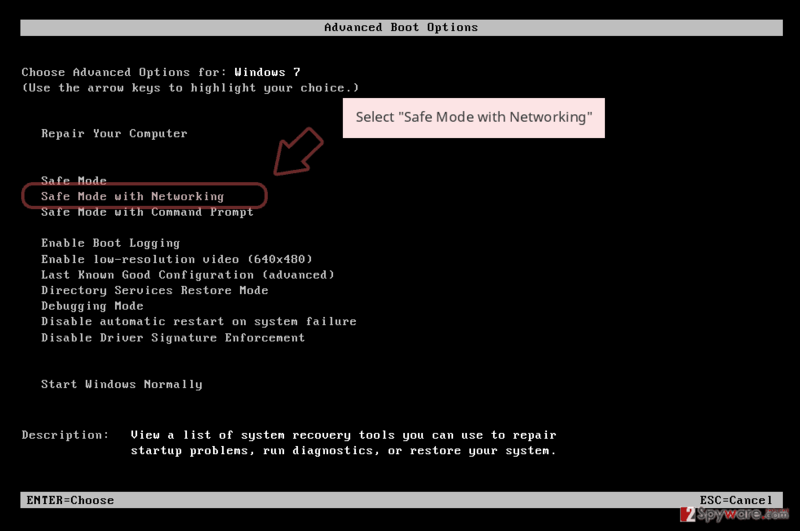 When a new window shows up, click Next and select your restore point that is prior the infiltration of Sad Computer. After doing that, click Next. 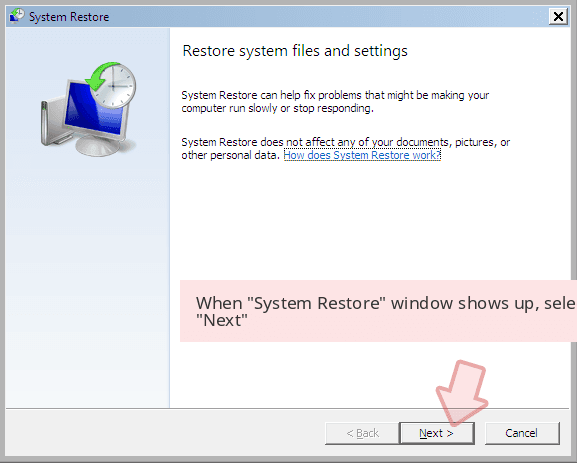 Once you restore your system to a previous date, download and scan your computer with Reimage and make sure that Sad Computer removal is performed successfully. Guide which is presented above is supposed to help you remove Sad Computer from your computer. To recover your encrypted files, we recommend using a detailed guide prepared by 2-spyware.com security experts. If you are wondering whether to pay the ransom price to decrypt .sad files or not, we advise you to save your money for something more warranted. There is no guarantee that these people will not scam you. Eliminate the virus and take a look at the following data recovery techniques that might be able to recover some of your files. 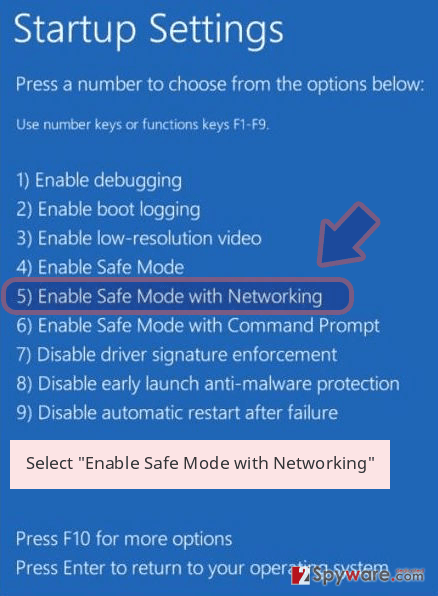 If you perform all of the steps exactly as shown in the instruction, you might successfully proceed with file recovery. 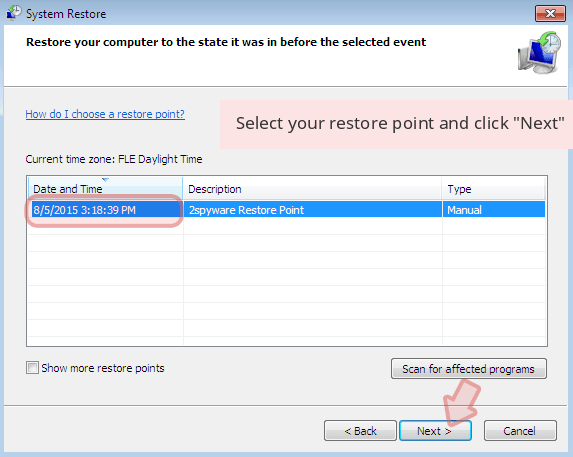 This third-party tool might appear to be truly helpful if you have launched System Restore. If Shadow Volume Copies of your data remain safe and untouched, proceeding with this method might recover some of it. No original Sad Computer ransomware has been discovered yet. ^ Margaret Rouse. Advanced Encryption Standard (AES). Search Security. Tech Target. ^ Avirus.hu. Avirus.hu. Spyware news. 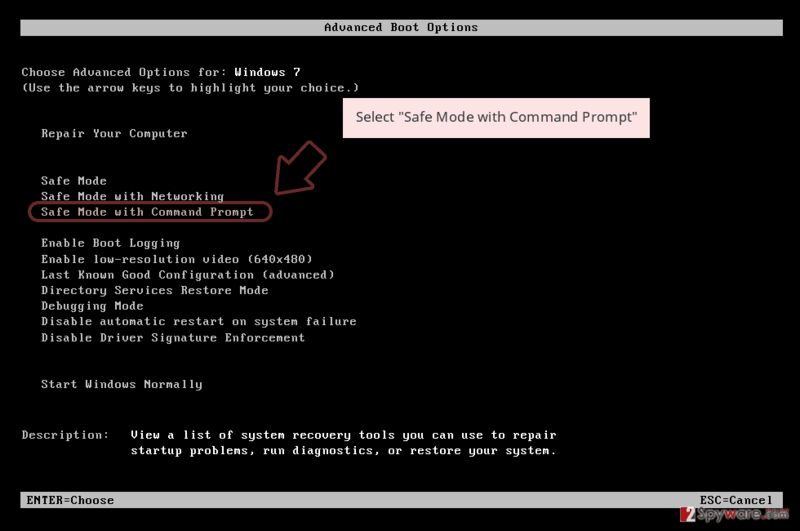 ^ Remote Desktop Protocol (RDP). Techopedia. Tech terms and definitions. This entry was posted on 2019-04-17 at 03:47 and is filed under Ransomware, Viruses. You can quickly scan the QR code with your mobile device and have Sad Computer ransomware manual removal instructions right in your pocket. How did you remove Sad Computer virus?